A lot of the folks I interview are always changing things up and making progress, so I thought it would be fun to get an update from one of them. Bryan Tublin is back on the show with a major change in his healthy food startup ambitions. Last time we spoke to him almost a year ago, he was running SimmerSoup, a healthy soup food delivery service in San Francisco. 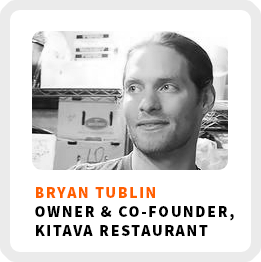 He and a partner opened up a healthy comfort food restaurant this past fall called Kitava. His goal is to make healthy comfort food more accessible. He shares why and how he made this major pivot in his business. Transitioning from a soup delivery business to running a restaurant by testing various business models. How Bryan overcame impostor syndrome in a field where he lacked formal training. How he jumpstarted foot traffic into his new restaurant. Trust your gut on hiring decisions because there is always the right candidate out there to fit your unique needs. Wake up time: Tries for 6:00-6:30 am to workout and do some key tasks before heading into the restaurant. Core work activities + habits: 1) Marketing, working to drive traffic and new business for the restaurant as well as their catering arm. 2) Ensuring a high-quality experience through staffing and training. 3) Continually looking ahead in the financials and working to make sure they’re aware of any changes that need to be made. Hiring people that will maintain your vision: Try to find people who genuinely care about what you’re doing and find that by asking the right questions. Self-care practices: Eating really well, working out, and taking Sundays as a recharge day. 90-day goal: Get sustainably profitable. 1) Reading a lot to learn about how other people have done it before. 2) Talk with people in your local community who have built businesses. 3) Being open to new ideas and learnings from any area of business development. 1) Identifying what you need to learn first. 2) Try different things. Don’t get hung up on trying to find what works best starting out, just pick something and try it. Mention the Life Skills That Matter podcast and receive a free Dark Chocolate Brownie (paleo, vegetarian, gluten-free) at Kitava with any purchase.